Professor Richard Faragher, Professor of Biogerontology here at University of Brighton and based in our School, will be debating whether science should be able to help us live forever (or longer at least). The debate will be streamed live tomorrow, Tuesday 7th November at 7pm (UK time) from the Universty of Santiago de Compostela. It promises to be an entertaining and informative discussion covering everything from the science of ageing to the ethics and social implications surrounding it. 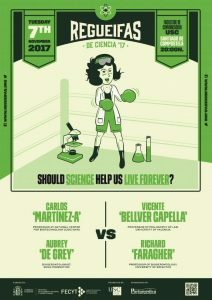 You can tune in to the debate live at the Regueifas de Ciencia ’17 website here you can also find out more about the debate itself. This entry was posted in chemistry, research, staff and tagged ageing, aging, brighton, debate, extended life, faragher, life, professor, regueifas, santiago de compostela, university by Alison Willows. Bookmark the permalink. I am rooting for Dr. Aubrey de Grey here!